Morten Traavik is, in tabloid terms, a controversial artist. Several of his projects caused somewhat strong reactions, such as the beauty contest Miss Landmine which featured women from Angola and Cambodia who were injured by landmines. Likewise, when Traavik was the “resident artist” at the Armed Forces Museum, the army management banned large parts of his exhibition series entitled Havoc (Hærwerk). In addition, his numerous North Korean art projects have all been disputed. Many people were surprised to learn that an artist, who is supported by Norwegian, public grants, chose to collaborate with the totalitarian regime on various cultural exchange initiatives. These include the 17th May performance Yes, We Love This Country which was recited in the North Korean capital Pyongyang on the Norwegian national day, and the Thorbjørn Egner-musical Kardemomemyang, played by North Korean music pupils during the Bergen International Festival in Norway. First even rock concert. Traavik’s most recent North Korean project is his most ambitious by far. The Norwegian artist organised, no less, the first foreign rock band concert – and thus probably also the very first rock concert ever – in the closed dictator state. And where The Rolling Stones in March of this year became the first rock band to play a large scale outdoor concert in the (increasingly less) communist Cuba, a much less obvious choice of ensemble entered the stage in Pyongyang for two nights in August last year (also marking the Korean national day entitled ”Liberation Day”). Although, Traavik’s choice of band, the Slovenian Laibach, with its, more or less, ironic use of totalitarian expressions and aesthetics, could be said to be just as fitting as any band to get North Korea rocking. Documentary. The project resulted, additionally, in the artist’s debut as documentary film maker, as he along with Latvian Ugis Olte, recorded the work behind, and subsequent implementation of, the concert with the ”documentary musical” The Liberation Day. The film saw its Norwegian premiere at Oslo’s Film from South in October, as part of the festival’s focus on North Korea. Its international premiere is 19th of November at the prestigious IDFA documentary film festival in Amsterdam, followed by a concert by Laibach. The alternating use of talking heads, observational sequences, TV-excerpts and other archive material to provide the necessary background information, has created a conspicuously conventional film. This especially considering it is created by a rather untraditional – not to mention ground breaking – artist. This is not a criticism, as a more experimental expression would have hindered the portrayal of this fairly unique story. Likewise, I do not see any problems with the fact that The Liberation Day does not afford us greater familiarity with the band, art project nor the phenomenon Laibach. 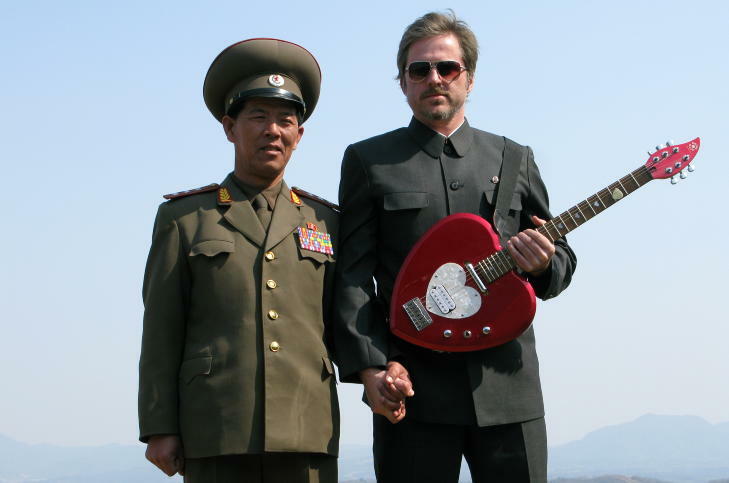 The most interesting issue here is the concert project itself and the rare glimpse into the North Korean society it permits us – a definitive documentary about Laibach can come another time. Hollywood-like resistance. The documentary shows how Traavik, as the concert’s artistic leader, faces resistance on par with that of a Hollywood-protagonist. Some due to technical issues, as the concert is breaking new ground, but much is clearly based on cultural differences. The authorities must approve the contents of the concert, and not everything (but a surprisingly large amount does) slip through their censorship. Another major challenge seems to be the fact that the North Koreans involved very reluctantly make even the smallest of decisions, due to their collectivist way of thinking. It is undeniably impressive that Traavik is simultaneously able to capture the events on film, but it is probable that his director college Olte is responsible for much of the camera work during the heat of the battles. At some point, there is also resistance from Traavik’s own camp, like when one of the members of Laibach decides to take a solitary walk around the streets of Pyongyang – something they are banned from doing. Despite this, Traavik seems to be able to film relatively freely in the country, contrary to the Russian film maker Vitaliy Manskiy. His documentary Under the Sun, also screened at the Film from South festival (and reviewed in the October issue of Modern Times), is based on a script presented to the director by the North Korean authorities, and which he had to strictly adhere to, in order to film in the country. But, by also recording how the authorities’ representative instructs a family to act out presumably everyday scenes, the film effectively (if somewhat repetitive) depicts a severely regulated North Korean society. And in a way, these two films can be said to complement each other, which Traavik also pointed out during a Q & A with Maniskiy during the aforementioned festival in Oslo. Virginal audience. It is difficult to review The Liberation Day independent of the project it portrays. You could criticise Morten Traavik for his naivety in choosing to collaborate with the totalitarian and inhumane North Korea, but this concert project is, never the less, more complex than just an attempt to bring new music to a suppressed and rock-less people. And it is undeniably interesting to witness the reactions of an audience who never before has experienced this type of music. This seems to be the case for everyone in the hall, seemingly a cross section of, more or less, ordinary North Koreans – although there are also some diplomates and visiting Laibach-fans among the invitees. Ironic fascism. The choice of band is also rather intriguing, a decision not only based on the fact that Traavik is an obvious fan (who, in the past, directed one of the band’s music videos). Laibach (named after the German name for Ljubljana) was founded in Communist Yugoslavia, and is both a band and an artist collective. With a massively gloomy and synth-dominated soundscape best described as an encounter between Depeche Mode and Rammstein, the band has made its mark with their cover versions of famous songs. Laibach’s versions give entirely new connotations to these songs, whether the eighties hits Life is Life and The Final Countdown, the Beatles-gem Across the Universe or musical classics taken from Jesus Christ Superstar or The Sound of Music. It is possible that Laibach utilise the expression of fascism as conscious provocation, the way various punk bands employed Swastikas and other Nazi symbolism, or even how Norwegian band Turboneger’s (whose alternative name was ”Nazipenis”) use of gay subcultural aesthetics. But, simultaneously, the band has kept a certain ambiguity in this respect – to possibly not be disregarded as a cheap gimmick. Although I am inclined to think that the cover band Laibach is an ironic nineties joke which has lost its appeal, I have to admit that Laibach as a concept has some interesting points. In particular, as an example of how the once free thinking and rebellious rock music, with its mass suggestion and idol worshipping, inhabits some clear similarities to fascism. I do, however, assume that these layers of interpretations went way over the heads of the North Koreans at the concert, and thus this project would give you an uncomfortable feeling – at least on paper – of partly making fun of them. But, at the same time, Traavik is portrayed as respectful to his Korean colleagues and the population in general. Besides, these concerts were, to a certain extent, geared towards this particular audience by featuring more songs from The Sound of Music, which were familiar to them. Propaganda. ”Art is either propaganda or decoration,” Traavik stated with his usual directness, at the abovementioned meeting with the Film from South audience. His point here was that both the aforementioned Under the Sun and his own film, is the former, although from – or for – differing perspectives. It may, however, seem as if the message in Traavik’s propaganda, at times, is overshadowed by his desire to shock. Thus, his own concepts become a bit like Laibach’s: Easily dismissed as a sort of joke, but probably more complex. Granted, The Liberation Day is a fascinating film which offered me a small glimpse into a society I know very little about. What North Koreans made of the Laibach concert is, however, difficult to say. The international premiere of Liberation Day is at the Amsterdam documentary film festival (IDFA) on 19. November.